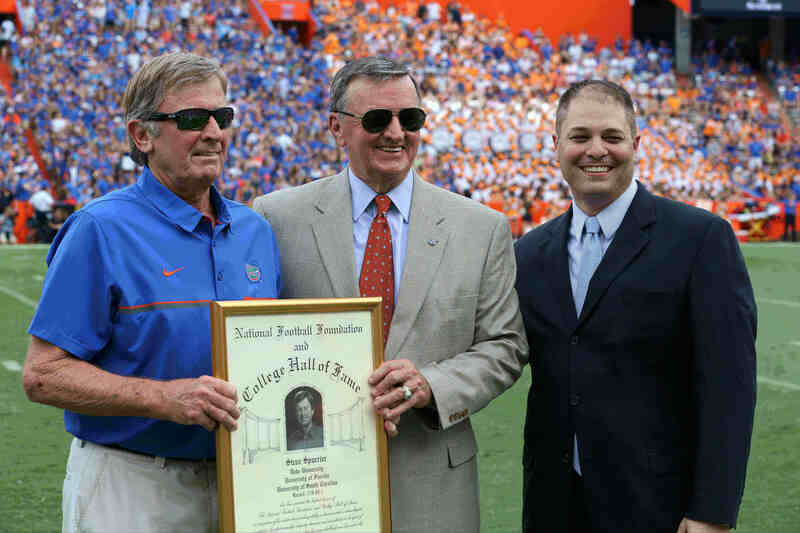 In addition to being a Heisman winning quarterback, a Hall of Fame player and now a Hall of Fame coach, Steve Spurrier is also an innovator. How many coaches can you name whose offenses were not only pioneering but fun to watch and fan-friendly? At each stop along his coaching career his offenses earned unique nicknames, and Spurrier’s style inspired a new generation of coaches. At the age of 37, Spurrier got his first head coaching job with the Tampa Bay Bandits of the United States Football League. His wide open passing offense was in the top three of the league in each of Tampa’s three seasons. His style of unique play became known throughout the league as “Bandit Ball.” The Bandits were also the only team in the league to average over 40,000 fans per game in each of their three seasons of existence.In 1987, Spurrier became the head coach at Duke. Employing the same philosophy, his “Fast Break Offense” created teams were fourth in the nation in passing that year and third nationally in both 1988 and 1989. In his first season in Durham, attendance at Blue Devil games experienced the second highest increase of any major college school in the nation. During his twelve seasons in Gainesville, the Gators were among that nation’s top ten passing teams ten times, and were in the top five in seven seasons leading the nation in passing in 2001. Under Spurrier, the attendance at Florida Field surpassed 85,000 fans per game for the first time. University of Florida became one of the top ten leaders in attendance nationally. After a short stint in the NFL, Spurrier retuned to collegiate coaching in 2005 at South Carolina. With the Gamecocks, fans were now witness to an offense that had the name that Spurrier most approved of: “Air Ball.” By the time the Old Ball Coach arrived in Columbia, Spurrier’s unconventional offenses of the 1980’s and 1990’s were now universally used and considered to be standard fare. He led the Gamecocks to unprecedented success with three 11 win season, a number four national ranking and five bowl wins. Let’s not forget, Spurrier also made the sideline look different. An avid golfer, he took to wearing a visor along the sidelines. No coach wore a visor before Spurrier, and it has now inspired coaches and fans alike to duplicate his style.